But her discoveries are only beginning, for the treecats are also telepathic and able to bond with certain humans, and Stephanie's find --- and her first-of-its kind bond with the treecat Climbs Quickly --- land both of them in a fresh torrent of danger. 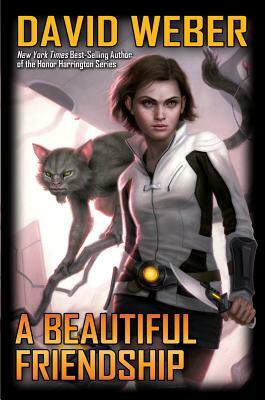 Galactic-sized wealth is at stake, and Stephanie and the treecats are squarely in the path of highly-placed enemies determined to make sure the planet Sphinx remains entirely in human hands, even if that means the extermination of another thinking species. With over seven million copies of his books in print and seventeen titles on the New York Times bestseller list, David Weber is the science fiction publishing phenomenon of the new millennium. In the hugely-popular Honor Harrington series, the spirit of C.S. Forester's Horatio Hornblower and Patrick O'Brian's Master and Commander lives on--into the galactic future. Books in the Honor Harrington and Honoverse series have appeared on fourteen best seller lists, including those of The Wall Street Journal, The New York Times, and USA Today. While Weber is best known for his spirited, modern-minded space operas, he is also the creator of the Oath of Swords fantasy series and the Dahak saga, a science fiction and fantasy hybrid. Weber is has also engaged in a steady stream of bestselling collaborations including his Starfire Series with Steve White, which produced the New York Times bestseller The Shiva Option among others. Weber's collaboration with alternate history master Eric Flint led to the bestselling 1634: The Baltic War, and his planetary adventure novels with military science fiction ace and multiple national best-seller John Ringo includes the blockbusters March to the Stars and We Few. Finally, Weber's teaming with Linda Evans produced the bestselling Multiverse series. David Weber makes his home in South Carolina with his wife and children.